My beloved Alaskan Malamute, Indee, died peacefully on the grass in my backyard. As much as I have tried, there is simply no "getting over" him. In a world of good dogs, he was my good dog. So I've decided to channel my grief into a dog hospice. As a hospice social worker for people, I understand the resources needed to cope with the loss of humans. As a grieving pet owner, I feel we need to do a better job of creating a way to say goodbye to a human's "best friend." From the moment the decline begins, to the moment we decide that "it's time", and beyond, including bereavement services for dog owners pre, and post, death. -a round-the-clock "intensive inpatient care" program for dogs who are in need of special attention in their last days of life, especially when their owner needs respite from the physical, and emotional, toll of caring for a canine at end-of-life. -music, choir, and other media access designed to foster a tailored, supportive setting for each dog and owner before, during, and after, the euthanasia procedure. -photographer/videographer to record a dog's "best day"
Good Dog Hospice will be a private, not-for-profit dog hospice, made possible by volunteer staff and community donations. 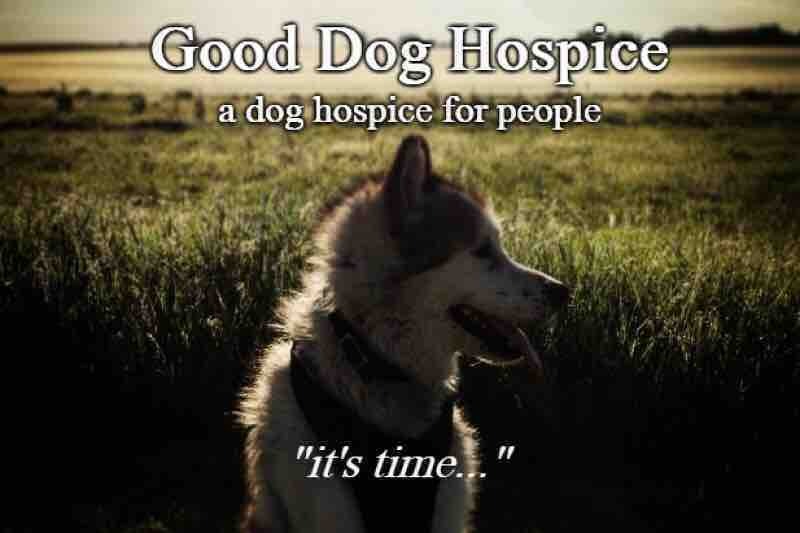 In a phrase.....this is a dog hospice for people. Your donation will be used specifically for getting Good Dog Hospice up and running, including securing staff, purchasing of supplies, creating informational/marketing materials, acquiring access to land, securing veterinarians, and many other needed items to ensure every dog's end-of-life is full of love and support, respect and dignity.